[ GARRY SAYS: Please read through this thread for advice on how to ensure you are buying a genuine A-Bike. I bought a fake A-bike from ebay a couple of weeks ago. I found this forum because my bike has some SERIOUS problems which I was looking to fix. (I think I am sending it back if the seller honours the ebay terms). Still I thought I might share the experience. Unfortunately assembly was terrible. It is missing a metal part in the left handle so it has problems to close correctly. Worse, the left and right chain regulators are on different settings and the chain "jumps" when I try to pedal (fixing this doesn't seem trivial, I want to experiment but have NO experience with bikes. Any clear instructions here would be appreaciated). The back wheel is not completely free (maybe for the same reason). If I manage to fix the rear wheel I would like to drive this 'til it dies and then decide to buy the original one. Any idea or previous experience ? To ride A-bike, we need a lot of LOVE. We need to be able to maintain and fix our bike as you mentioned none of town repair shop want to put their hands on it!! Anyway, as long as it's not serious part breakage, A-bike is pretty much DIY maintenance friendly. The bearing mis-alighnment seems common with those A-bike counterfeits. To fix the chain tension, download this instruction manual and refer page 31. Okay, the pdf might not tell you much, but it's simple. 2. Unscrew 4 fixing screws which holds the tensioner/bearing holder, then adjust their position as you please. Ive got a copy and a 'urban ryder' apparent licenced model. As nice as the copy was, its a night and day difference in the quality and performace. thats about all you'll get from the freewheel, if something else doesnt go first. How can you tell if it is an original or a Chinese copy? Anonymous wrote: How can you tell if it is an original or a Chinese copy? Each genuine A-bike has this printed on the tube. I can't believe it! I mean mine looked so real when I bought it but it hasn't got those markings on the tube like in the photo! Another thing: surely if there were replicas being made, they could easily have duplicated a few little letters on the post??? It makes no sense! smithra wrote: Another thing: surely if there were replicas being made, they could easily have duplicated a few little letters on the post??? It makes no sense! I can only tell you that I haven't seen any fake A-bikes have those markings on the tube yet. Last edited by Amuro Lee on Wed Oct 31, 2007 7:21 pm, edited 1 time in total. Please bear in mind that the Sinclair Research A-Bike, sold by Mayhem UK (so the genuine European model), does not have the same writings on the tube. 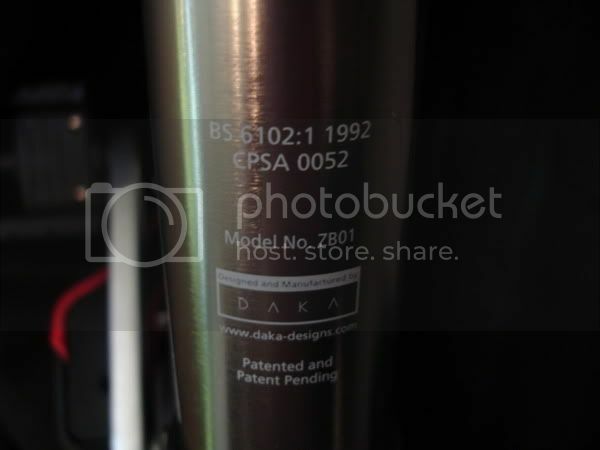 For instance, it has no Daka logo. I don't have my A-Bike or a picture at the ready, so I can't tell you exactly what you should be looking for (apart from the Sinclair Research and Mayhem logos and some writings about the model (ZB01 too) and other things about patents pending, but I guess some friendly forumer will be able to attach a picture soon. The genuine Japanese model of A-bike also has those markings on the tube. I bought mine out of need. A recent move caused my bus shelter to be 1.5mi from my front door and I needed the smallest bike possible to aid me in my morning commute. If I could have a genuine A-bike, then I would have done so. Out of the box, the fake looks pretty convincing and is a blast to ride. However there are quality issues with the screws that mount the brake bands to the the bike, in my case, the rear set has rounded out and an allen wrench cannot remove them now. I will replace these screws as well as the front ones with a stainless steel set from my local hardware store. The rear tensioner. The odd thing is that L is too loose, M is too tight. If you suspect the A-bike you are buying is a counterfeit copy there are a number of steps you can take to check its authenticity. 1) Check the A-bike has all the official logos and stickers in the correct locations, including the important "Distributed by MAYHEM UK LTD" sticker. 2) Check the A-bike carries an official batch and serial number, located on the underside of the crosspeice. 3) If in doubt, ask the seller for their legal business trading name, and contact A-bike.co.uk or Mayhem UK to confirm they have been supplied official Sir Clive Sinclair A-bikes. I found another way to tell a fake from a real one. Take your A-bike for a five mile loop around your local park. If the right-side pedal self destructs after two miles leaving you to limp home with one pedal, then it's definitely a fake. At least that's what happened to me this morning. That is a sad start of the New Year. in USA. Such a big country.